Microsoft to Tease Windows 8 at CES Today ! The International Consumer Electronics Show 2011 (CES) will kick off today, commencing with the keynote address from Steve Ballmer, CEO Microsoft. 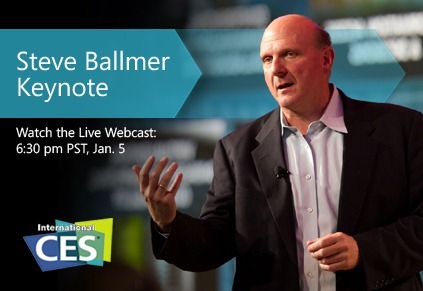 His keynote like always will be streamed LIVE from Las Vegas on January 5th, 2010 at 6.30 pm PST (Pacific Standard Time), which is 2:30 am GMT. Click here to view what time it will be in your region when Steve delivers his keynote. Reports are coming in that Microsoft may announce a set-top box in answer to the Apple TV and Google TV. Also, Windows Phone 7.1 is expected to be announced with copy-and-paste functionality, with the addition of CDMA-based Windows Phone devices. Moreover, according to a report from WinRumors, a sneak peak of Windows 8 may also be teased at the event. And lastly, “Avatar Kinect” feature for Xbox 360 is also rumored to be announced today. Those of you who couldn’t be there at Las Vegas this year, you can all enjoy the action streamed LIVE from the comfort of your couch. To watch the keynote address Live, follow this link here. visit this link. Stay tuned to us as we will cover all the bits once the dust has settled !